Ten years of tracking makes me feel old, and compulsive, but also proud. Being the health-geek that I am, self-study is a source of endless fascination, inspiration, and exploration. It was especially interesting to track my transition from protein-at-every-meal to totally being plant-based, for example. This allows for accountability, but on your own terms. For some, a buddy-system is additionally helpful, so consider comparing notes with a friend. For others, the idea of sharing is a no-go, in which case you don’t have to show your diary to anyone, unless you’re my client. 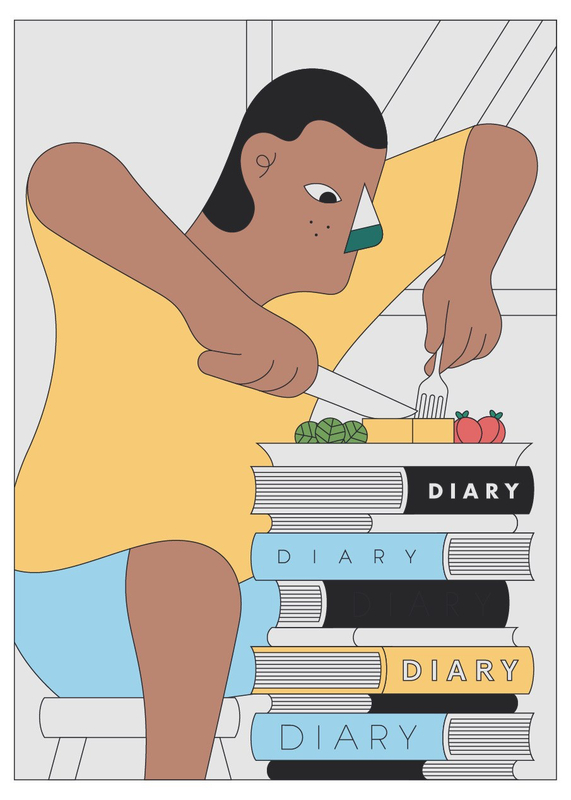 The downside is that food journaling is another thing to do every day. But, there are apps for that. Obviously, I would recommend SparkPeople; it’s been so convenient for me over the last decade that I’ve never wanted to switch. Depending on your goals and aesthetic standards, there are a ton to choose from. MyFitnessPal and LoseIt are popular, and some newer apps on the market now positioned as macro-trackers are also great (e.g. Fitocracy Macros). The benefit of tracking digitally is that you can automate things (like saving meals or favorite foods) and save a lot of time. But they can be too obsessive for some. If you’d rather not track calories but still want to glean some broad-stroke insights about your intake, good old-fashioned paper is great, or a Google Doc, which I like because it’s accessible any time. Tracking can be quick, too. My daily entries now take less than a minute to enter. Beginning is the biggest time-investment, but over time, and especially with apps, it gets a lot easier. – Get to know serving sizes. For example: Three ounces of protein is as big as a deck of cards; a teaspoon is dice-sized, and a ping-pong ball-sized “scoop” of anything is two tablespoons. – It’s not all about the calories. Try tracking other things you care about or are working on, like sugar intake, energy fluctuations, or whether eating less protein actually makes you feel better. Tracking progress can be really motivating, in the same way that running a faster mile or lifting a heavier weight can be. – Consider recording how you feel, too. This ensures that it’s not just about calories (because it’s not!) but a more holistic look at a relationship with food. This is my favorite part about my clients’ diet tracking. We learn so much there. Like, your gluten-free bread might actually be causing that bloat. Avocados make you feel more full than meat. Breakfast is okay to skip because you’d rather have your smoothie in the afternoon when you’re in the mood for a treat. – Stay the course and know that it’s a new habit, harder to start than to maintain. – Finding time in our busy schedules is hard when you want to start food journaling. If you’re the calendar-type, set reminders to record food a few times a day. Later on, you won’t need them. (Some apps have them built in.) For the schedule-averse try putting sticky-note reminders in your kitchen, at your desk, or wherever you tend to eat. – Don’t get caught up in the measurement details. It’s okay to estimate. If you’re not sure how many ounces something is, or what exactly is in the juicery’s smoothie, taking your best guess is allowed. So is asking your server what’s in what you’re ordering, which I do all over town. – Avoid obsession by not looking at your data until the end of the day or even weekly. Like with weighing yourself, daily fluctuations will occur. – I’d also suggest tracking your food as you’re eating it or immediately afterward. Waiting until the end of the day guarantees missed meals or food amnesia (which is actually a thing). Know that there’s no best time to start. But, if you need some suggestions: Monday, the first-of-the-month, or right now are all great options. Give yourself a week to decide on a tracking method and how long you’ll track for (even if it’s just two weeks). Circle it in the calendar, mentally commit, then go! I guarantee you’ll learn something new about yourself. Older PostI Helped Turn Wellness Into a Luxury Good. Now It's Out of Control.